Back in the kitchen, I decided it was time for me to make my first galette, a French term for flat, free-form, crusty pies. They don’t have to look perfect to look perfect, if you get what I’m saying. When I came across a recipe on Williams Sonoma for a recipe that uses a food processor to do all the hard work AND it made enough dough for three galettes, two of which I could save for later, I knew I’d found my start. 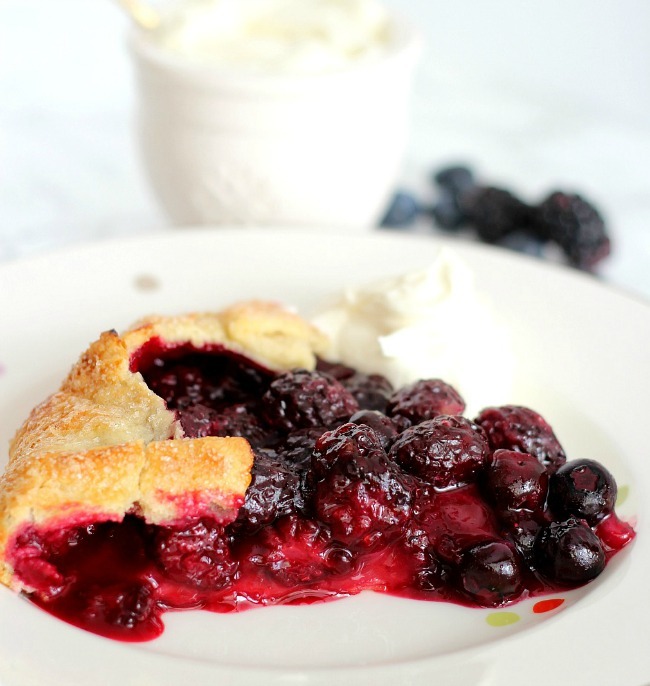 Since blackeberries are a bit tart even when they’re at their peak, I used a mixture of blackberries and blueberries, three to one. Some nice lemon zest and juice for freshness. The only other addition to the berries and lemon is a little sugar and flour. I’m sorry I didn’t take a picture of the dough in the food processor but really that step could not be simpler. You’ll, by the way, think that you’ve got way too much flour in the processor and that it’s never going to work, but several chunks of butter and some drizzles of ice water later, the food processor does it’s business and the dough starts to come together. I then turned it out and divided it into 3 equal pieces. I used my kitchen scale, but you can surely eyeball it. Then on a floured surface I rolled out one of the pieces into a 13-inch “round”. As you can see, it doesn’t even have to be perfectly round. Then fold the dough in half, place on a parchment lined baking sheet and unfold it. Add your fruit to within two inches of the edge. Then just fold the edge up over the filling, forming loose pleats. 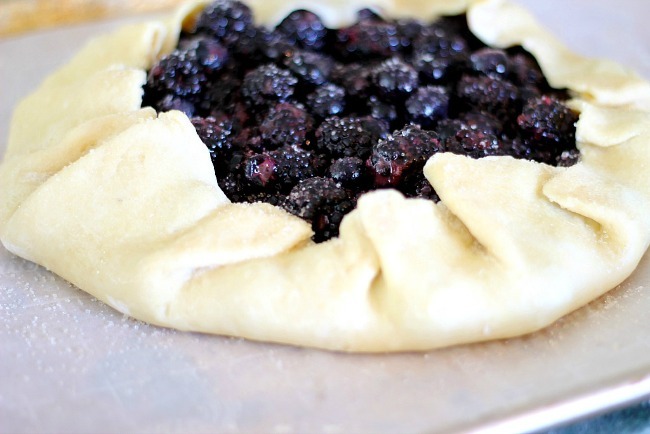 Brush the top of the dough with egg white and sprinkle with more sugar over the crust and fruit. 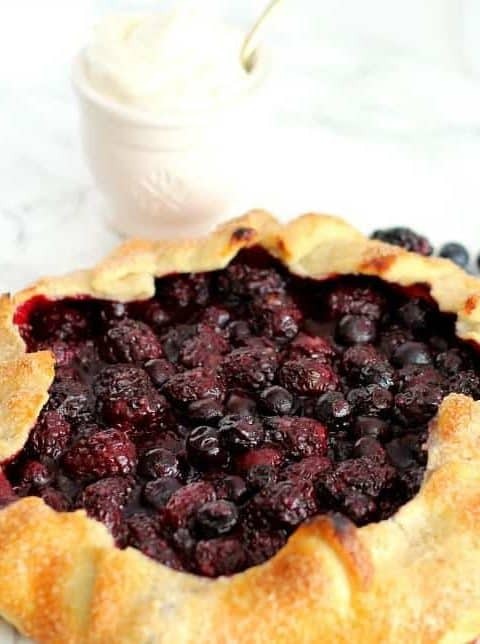 Less than 30 minutes later, you have a beautiful pie that with a flaky, tasty crust and the fruit mixture makes its own syrup-y sweet goodness, thanks to the sugar and flour. 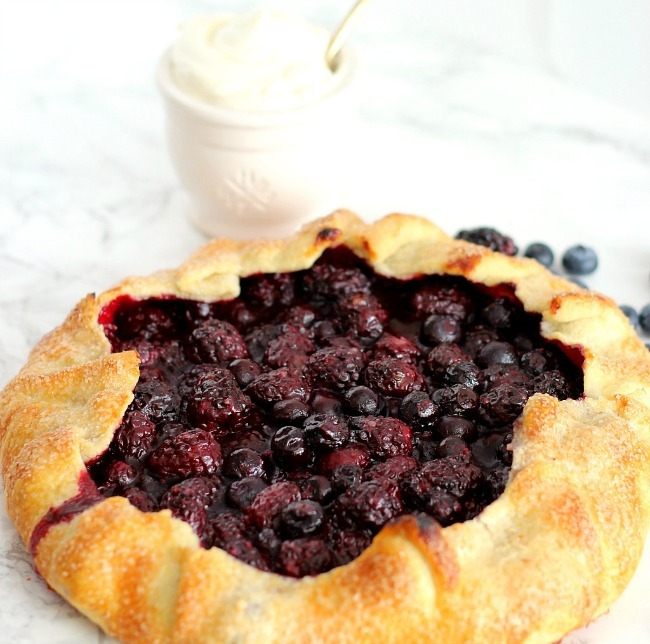 You can obviously make this tart with any berries, whatever mixture you find. I can’t wait to try this with rhubarb and strawberries. I made another galette the very next day and the dough that had been refrigerated overnight may have been even more flaky than the one I made the day of processing. Bring your refrigerated dough to room temperature for about 20-30 minutes, until it’s pliable enough to roll out. I’d still like to become competent at making a traditional pie and have it look fancy and all that, but in the meantime, a galette is great for a quick, easy, and impressive dessert. 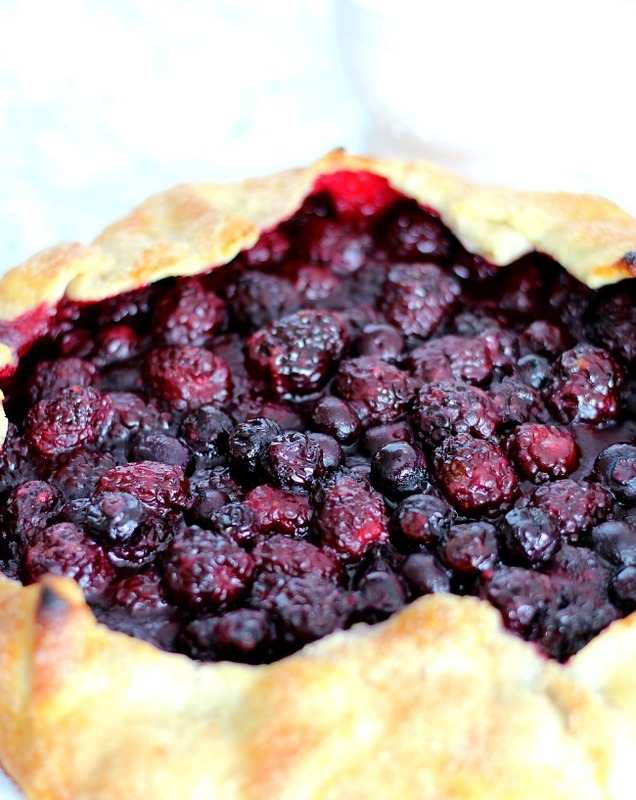 With the fruits of summer coming around, and this dough recipe that makes enough for three pies, you can’t go wrong here. Give it a try! You’re going to love it. Recipe note: The printable recipe will yield 3 disks of dough for 3 galettes, but the fruit listed is enough to fill one galette. You will mix the dough, divide into 3 disks and save two for later. Make one now with the amount of fruit listed. This recipe makes enough dough for 3 galettes or pies or pot pie tops, and it's flaky and delicious! The fruit listed is enough for one galette. An important note here: You will preheat the oven to 425F degrees but as soon as you put the galette in the oven, you need to turn it down to 400F degrees. DO NOT FORGET TO TURN THE OVEN DOWN! In a food processor, combine the flour and salt and pulse briefly to mix. Scatter the butter over the top and pulse just until the mixture forms coarse crumbs about the size of peas. Drizzle the ice water over the flour mixture and pulse just until the dough starts to come together. Transfer the dough to a work surface, divide into 3 equal pieces and press each into a flat disk. Set 1 disk aside and wrap the remaining 2 disks in plastic wrap for future use (see note below). Preheat an oven to 425°F. Use middle oven rack. Line a baking sheet with parchment paper. 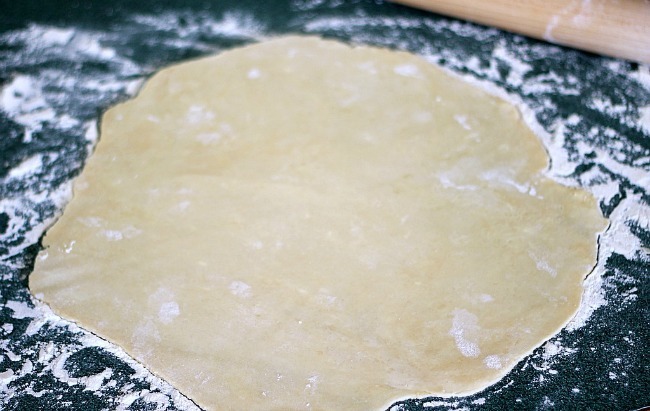 Place the dough on a lightly floured surface and roll out into a 13-inch round. Fold the round in half, transfer to the prepared sheet and unfold the round. In a small bowl, mix the sugar and flour together. 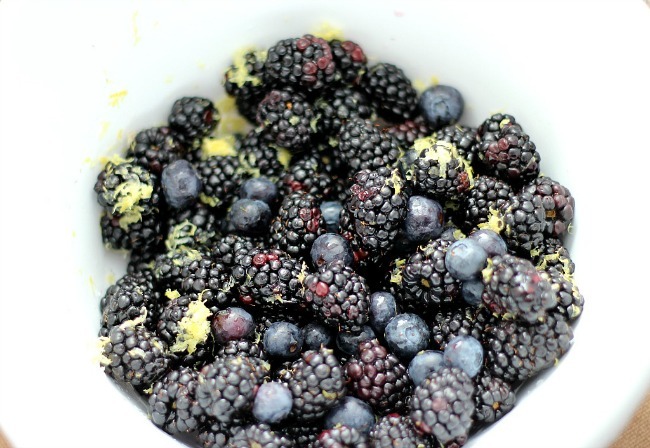 In a medium bowl, add the berries, lemon zest and lemon juice. 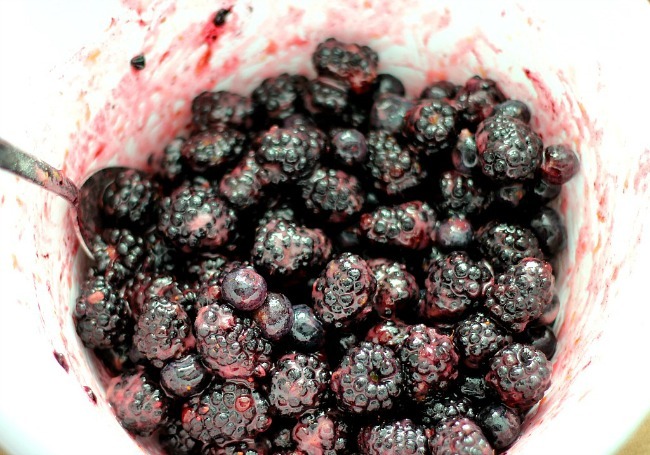 Toss the sugar/flour mixture in with the berries and stir lightly until well mixed. Spoon the filling onto the dough, leaving a 2-inch border uncovered around the edge. Fold the edge up and over the filling, forming loose pleats. 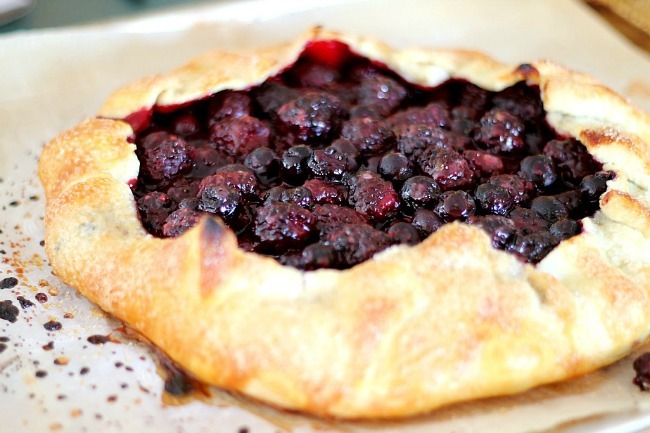 Using a pastry brush, lightly brush the crust with egg white, then sprinkle sugar over the crust and top of the berries. Now dot the 1 tablespoon of butter cubes (or grated butter) over the top of the fruit. You don't need a lot of this, but doing so will help the fruit achieve a nice sheen after baking. Transfer the galette to a wire rack and let cool slightly. Cut into wedges and serve. Cook's note: the two extra disks of dough are a bonus! 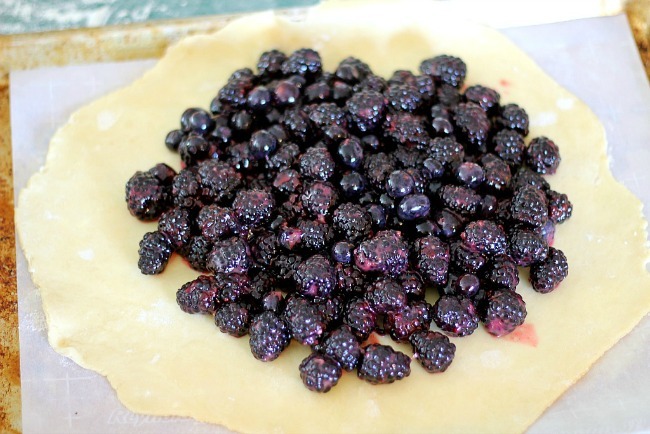 Use to make other fruit galettes quickly during the week. Extra disks can remain in fridge for up to 5 days, or refrigerate for up to 2 months. I found the disk that had been refrigerated overnight was even more flaky than the one I made immediately. Extra tip if your fruit filling is very wet, like juicy mid-summer strawberries- Before piling on the fruit, dust the galette dough with just a tiny bit of semolina flour or breadcrumbs before adding the fruit. This will ensures the crust won't get soggy. Recipe adapted from Williams Sonoma. This looks amazing! I can’t wait. I’m making this today!